He’s not asking for much. All Gregor Maravilla wants to do is feed all of the starving children on the planet. So when he’s selected to join Camp Save the World, a special summer program for teenage activists from all over the country to champion their cause, Gregor’s sure he’s on the path to becoming Someone Great. But then a prize is announced. It will be awarded at the end of summer to the activist who shows the most promise in their campaign. Gregor’s sure he has the prize in the bag, especially compared to some of the other campers’ campaigns. Like Eat Dirt, a preposterous campaign started by Ashley Woodstone, a famous young actor who most likely doesn’t even deserve to be at the camp. Everywhere Gregor goes, Ashley seems to show up ready to ruin things. Plus, the prize has an unforeseen side effect, turning a quiet summer into cutthroat warfare where campers stop focusing on their own campaigns and start sabotaging everyone else’s. Gregor just wants to spend summer at a camp that could save the world. He did not know what he was getting into a first. Camp was just like high school full of bullies, girl crushes and groups. Gregor just belong to his own group doing his own thing. Once there an prize involved for an contest to work with his idol camp goes kind crazy. It everybody for themselves and the camp falling a part. Can Gregor be the hero and save the camp or will it be his worse summer ever? This book is kinda not my type of book. Not a huge contemporary fan so the story predicable for my taste. Some might enjoy this better then me. It was good idea, kinda high school feel but at camp instead. If you looking to going to camp this summer then this book might be the right fit for you. Happy Reading! Hadley Jamison is shocked when she hears that her classmate, Archer Morales, has committed suicide. She didn’t know the quiet, reserved guy very well, but that doesn’t stop her from feeling there was something she could have done to help him. Hoping to find some sense of closure, Hadley attends Archer’s funeral. There, Hadley is approached by a man who calls himself Death and offers her a deal. If Hadley accepts, she will be sent back 27 days in time to prevent Archer from killing himself. But when Hadley agrees to Death’s terms and goes back to right the past, she quickly learns her mission is harder than she ever could have known. Hadley soon discovers Archer’s reasons for being alone, and Archer realizes that having someone to confide in isn’t as bad as he’d always thought. But when a series of dangerous accidents starts pushing them apart, Hadley must decide whether she is ready to risk everything—including her life—to keep Archer safe. From award-winning Wattpad author Alison Gervais (HonorInTheRain) comes In 27 Days, a story of redemption, first love, and the strength it takes to change the future. Hadley is known as the rich girl in school, has friends and parents that always away. When one day she heard the news of her classmate Archer had kill himself, she felt sad not knowing much about. The only things she remembers is that they had class together once. Feeling sadden by his death, she signs and contact with death to go back in time. With 27 days to prevent his death, can hardly save his life but at what cost? In the end lives are hang in the balance while time is running out to save Archer. Is Hardley the one who can do it? The book was well written and have fallen in love with the story. Love how death stops by time to time warning Hardley to save Archer. There also some hidden dangers while signing a contract with death. A touching story of finding one self and saving lives. So are you ready to enter death”s contract and journey through the lives of Archers and Hardley? Happy Reading! This book is about an girl name Sorina with the girl of illusions. She made up her tight knit family and friends on the road. Mostly she is like an loner keeping to self and preforming her act for her father figure. Then one night one her illusions Gill dies and it’s up to her to find out what’s happening within her family and learn the truth before everyone she loves dies one by one. This book is filled with magic and fantasy, sometimes you don’t know what is real or fake anymore. As you dive into Amanda Foody new book you get an long history lesson, all the while trying to find out who the killer is. So enter the freak show for yourself and find the answers you may seek for yourself. Congrats on a happy release day for Amanda Foody today. Happy Reading! 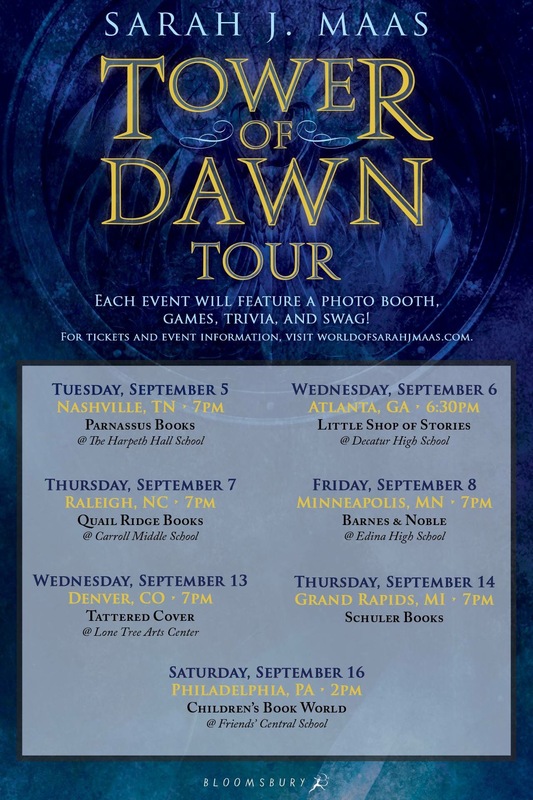 Here are Sarah J Maas tour dates. Sadly there are new rules for her signing so please read her website carefully for each event. Some rules are only 50 people get to take photo with Sarah and book personalized with a raffle drawing, all book are already presigned. Check out her website here http://worldofsarahjmaas.com. Despite the rules just have fun. Happy Reading!! Quincy an lone survivor of an mass killing at the cottage. She forever became the final girl when all but her friends where killed. Now years later she forgotten what happen the faithful night and try to move on. Have her own baking blog, am supported boyfriend and the police officer, Cooper her close friend. Cooper is the one who saved her life and been keeping an eye out on her. Word gets out another final girl Lisa passed away. It brings home Sam from hiding and contact Quincy, Sam is also an final girl herself from anyone tragic event. With these final girls coming together can the solve what happen to Lisa? Lisa death will have to take Quincy back to the past and remember that horrible event years ago, if she even wants to remember. This book is an good adult thriller, its out not. Leaving you guessing on what happen to Lisa and what pass secrets Quincy could be hiding from the attack that killed all her friends. Well if you in mood for an adult thriller then pick up this book and see what secrets you will unearth. Happy Reading! Aurora is a a very shelter princess, living in the care of her castle life without the knowledge of the outside world. Coming from a long powerful magic bloodline, she never once gotten her powers in. Now her mom must marry her off in hoping to protect her daughter. Not liking the man she gonna marry she runs off and discover the outside world for herself with a little help. Can Aurora find the strength to rule her kingdom and the power she needs to rule? Mostly this book is finding out who really are. Watch as Aurora grows and becoming an warrior to lead her kingdom without having to get marry. Have fallen in love with the story and the places it took me. With high fantasy reads you get to see lots of magic things happening. Mostly action packed and finding yourself. So journey with Aurora and watch her become the princess she meant to be. Happy Reading! The story picks up where Celestine is branded and now on the run for her life. Now she knows what the flawed life is about and how mistreated they are. Celestine has the power to change the way things work if she is now afraid to use it. Finding proof and the truth is gonna be hard. With hardly many people to trust, can Celestine be brave enough to exposed the truth and can she get everyone treat each other as equals in the end? This is book is filled with action and a lot of running. There no more books after this one. If you have yet read Flawed you can check out my first review of it here, Flawed (Flawed #1) by Cecelia Ahern. So you have to read and find out for yourself how it will all end. Happy Reading! I am happy The Dazzling Heights is coming one next month. The wait been killing me to find out what’s happens next. If you have yet read The Thousandth Floor then you can read my review of it here, The Thousandth Floor (The Thousandth Floor #1) by Katharine McGee. Also if you preorder the book you get this cute make up bag. Click on the link here to claim nice book swag, Preorder Swag. The author is so nice on twitter also. Sadly shy to talk much with more authors on there. So here it is the cover and summary again to Dazzling Heights! Well guys is here the big cover reveal and summary for Marie Lu new book, Batman. Which I can not wait to read this book. When I first some popular young adult got together to do DC novels, I was so happy. Look for my review of Wonder Woman later this month. Well will not leave you guys hanging any longer here it is the cover and summary. So my barnes and nobles just host Elise Kova last night. Love when do signing events all the time there. Can say the staff and the event planner are so kind and sweet there. It was great meeting some old faces in the crowd. Not very good with people names but will work on it. Enough about the people let’s get to Elise Kova event. Well thanks to some nice thunderstorms last night she was running a late, but she did bring some awesome book swag and a poster with her. Found out that her book is only a three book series sadly. Lucky in December we shall not have to wait long for the third book. Hope she to comes back to my barnes and nobles soon for another event or just to just hang out. While waiting for my ride I got to talking a little to the author. You know shy person me, was so tongue ties the whole time. Some hot guy wanted me to explain Elise book, lucky I am glad he listen to me and talk to the author. Even he bought the book and got it sign. So it was an pretty awesome event. If you have yet read Elise Kova book I suggest you do, here is the review of her first book, The Alchemists of Loom (Loom Saga #1) by Elise Kova. For Sarah J Maas fans and the love of high fantasy you will fall in love. So enjoy some awesome pictures I took of the event. If you don’t follow me yet on ig, it’s jenneh_penneh. Also if you wants blog bloopers of Bella head of to her facebook page, Abellafairytale So Enjoy and Happy Reading!